Ideal in light/heavy duty, explosion proof applications! 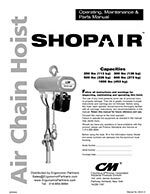 The CM ShopAir air chain hoists can be used as a work station hoist or as a production line hoist. 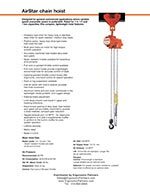 Features include: Lightweight, rugged and compact design, Variable flow two lever pendant for precise load spotting, Gear train is lifetime lubricated, Made in USA, Overload device, Threaded external exhaust for piping away exhaust in clean room or painting applications. 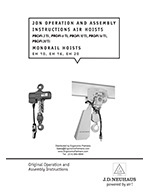 The JDN PROFI series of hoists, are proven in heavy-duty industrial applications. The mini brings that famous JDN quality to the light duty sector. 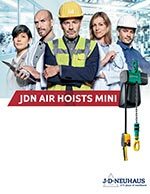 JDN Air Hoist Features Include: Capacities from 275 pounds to 10-tons, Patented wear-resistant braking system, Rugged lightweight aluminum housing, Precise lifting and lowering speed, Low headroom, Easy maintenance and operation. 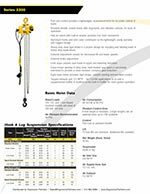 These pneumatic hoists are designed for general commercial applications where variable speed pneumatic power is preferable. Features include: Aluminum Frame and Cover, precision cut, heat treated helical and spur gears for quiet, efficient operation, Overload Protection, Mechanical Load Brake, Internal Muffler - reduces sound level, Multi-vane Rotary Air Motor. 100% on and up time - Air motors are inherently self cooling, and thus are suitable for an unlimited number of motor starts. 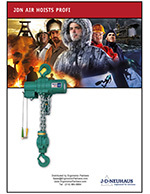 A requirement for heavy duty applications. High ambient temperature - Self cooling also allows the pneumatic hoist to operate in high ambient temperature environments. Explosive environment - There is no electrical arcing hazard to cause explosions in areas such as paint booths or petrochemical facilities. In addition to electrical arcing, friction sparks can also be of concern. 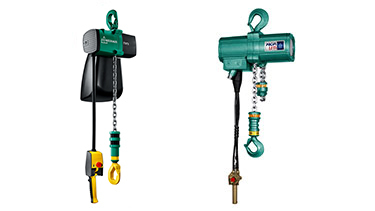 Ergonomic Partners can add spark-resistant protection including stainless steel hook latches, bronze hooks, stainless steel chain modified load sprocket, guide and stainless or anodized lower blocks. Keep in mind that stainless chain is not as durable or strong as standard chain. 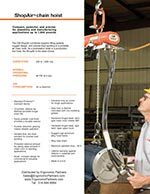 Care should be taken when applying stainless chain to a high duty cycle. 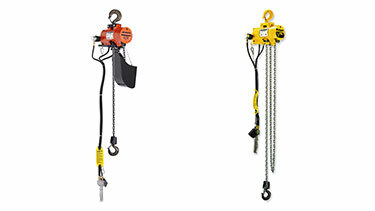 Lift Speed - Air hoists normally lift loads at a faster rate of speed than an electric hoist. 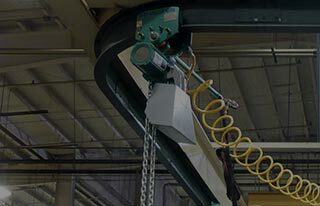 Spotting Control - Unless an electric hoist is purchased with variable frequency control, it will not have as good of spotting control as an air hoist. 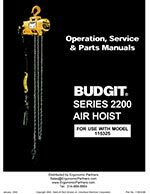 An air hoist will typically lift the load more gently than an electric hoist, which has an initial "tug" when picking up a load. 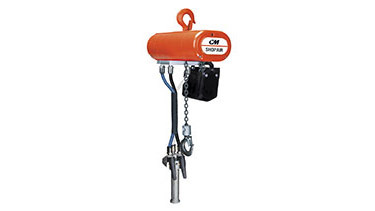 Pneumatic hoists are ideally suited for the following industries: Aircraft Industry, Paper Industry, Automotive Industry, Refineries, Chemical Plants, Atomic and Coal Power Stations, Rigging Crews, Super Sack Handling, Maintenance Shops, Food Industry, Machine Shops, Foundries, Spray Booths, Leather Plants, Printing Industry, Shipyards and Ship Building, Dairy	Installations, Pharmaceutical Industry, Oil Storage, Large Kitchens, Mining, Crane Manufacturing, Glass/Ceramics, Galvanization, Sawmills, Cement Industry, Vacuum Technology. 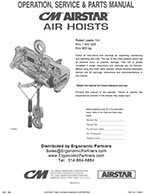 Let an Ergonomic Partners sales representative assist you to pick the correct CM, Budgit, or JDN air chain hoist for your application. Please contact Ergonomic Partners today. Ergonomic Partners serves clients from coast to coast, Canada, Mexico and especially focused in the states of Missouri, Illinois, Indiana, Kansas, Arkansas, Mississippi, Nebraska, Tennessee, Kentucky, Iowa, and Oklahoma.